The flowers starting to bloom, the birds are singing with joy, everything is green, but the house still feels like it’s stuck in the winter time. Spring cleaning allows us to freshen up our homes to get ready for the warm seasons. If you are one of those that postpone the season cleaning of the home then today I will highlight the best tips on how to spring clean your house in the shortest period. Some of them require a bit more time but do not let it discourage you, because, in the end, your home will shine like never before. 2 Remove the dust from the blinds and curtains. If you are cleaning them once a year, then take your time and make sure you do it correctly. 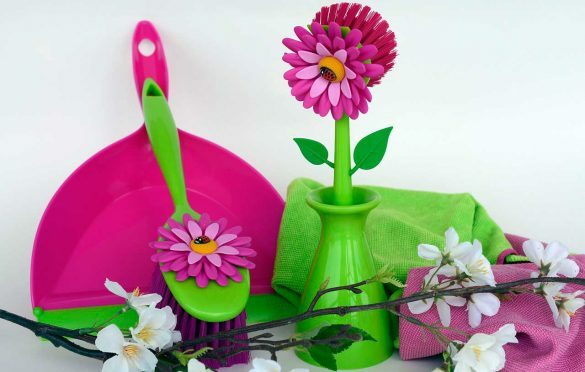 The best time to clean is in the springtime. Remove all the objects that are not supposed to be there. Dust and wipe the surfaces with a microfiber cloth. Make sure the microfiber cloth is wet. It will stop the dust spreading through the air. Take the broom and remove all the spider web on the ceiling and top corners. Remove the dust from the blinds and curtains. Do you remember when the last time you cleaned the dust from the blinds was? No? Spring is the right moment to do it. Use a duster and microfiber cloth. For the stubborn stains use cleaning liquid. Take the curtains down and shake the dust outside. If they are filthy and you have enough time you can wash them. If you can’t do it yourself, there are cleaning services that will do this for you. Remove any furniture from the carpets. Vacuum with the brush attachment to remove all hair that is stuck on it. Sprinkle some baking soda before vacuuming to reduce the unpleasant odors. If you want to know more about home cleaning the carpets and rugs read this article. But if you do not have enough time, you can take them to a cleaning service near your home. If you take care of your carpets more frequently they will last longer. Remember the dirt can damage the rugs and carpets. The sheets, mattresses, and pillows collect dust, sweat, and saliva every day, which can cause an accumulation of bacteria and other microorganisms. This accumulation is happening a lot in the winter periods as you do not take your sheets and mattresses out too often as you would do in the spring or the summer. Mix a few drops of essential oil and a glass of 75% alcohol. Add a small spoon of baking soda to the mixture and until all is dissolved. Spray the mattresses and with the mixture and let them dry. The germs will immediately die from the alcohol, and the essential oil will freshen the bed. Make sure to clean the bed of bacteria every year. If you decide to clean your upholstered furniture, you will be surprised by the many coins, pens or various small items you will pull out from the dusty corners of the armchair and couch. Who says that cleaning can’t be fun? If you haven’t cleaned the upholstered furniture in years, you might want professional carpet cleaners to do their magic in the living room after they have cleaned your carpets. Cleaning the windows on a sunny spring day is indeed a winning combination. You can clean while enjoying the warm spring sunshine and in the end, you will end up with perfectly clean windows. Do not forget to clean the window frames as well. They accumulate a lot of dust. If the bookshelves only had books on them, then their cleaning would be an easy task that would be solved in several moves. However, they are often trapped with figures, photographs, vases, and other objects, so we continuously delay their cleaning. If there are lots of tiny items, it would be smart to put them in a larger glass container. It will save time, while the dust from the bookshelf will be easier to remove. Do you admire your shiny kitchen? Do you think it’s spotless? Check the condition, for example, behind the fridge and the oven, or behind some other kitchen elements. It will be an unpleasant surprise when you notice what you can find there, besides the dust. And once you have pulled the refrigerator, take another minute and clean the condenser windings from the dust, so that it works more efficiently and consumes less energy. Spring-cleaning your kitchen will not only improve your health but also boost the desire to find the “Jamie Oliver” in you. Spring cleaning is an excellent opportunity to clean your home appliances such as the fridge, the oven, and the dishwasher. Just be careful while cleaning the refrigerator or the freezer: put all the food in a larger bowl with ice so that it doesn’t go wrong while you are cleaning. Remove unpleasant odors with a mixture of warm water and white vinegar. When you return the food to the refrigerator, try to order it in a way that will help you notice if something is about to expire and start to smell. You can clean the dishwasher by turning it on empty with a cup of vinegar. This is one of the most straightforward tasks on the list of activities from your spring cleaning, so do not skip it. At least once a year, review the shelf life of all the groceries. Open the windows from time to time to get fresh air inside and reduce the moisture. Cleaning a house in the springtime can be a daunting task, but if done correctly it can improve your and your family’s health and lifestyle. If you want you can even create a spring cleaning checklist that will help you clean your home faster and more efficient. We hope we motivated you enough to go on and make your home shine. If you need more tips about spring cleaning I found this great resource, that contains 50 hacks on spring cleaning. If you have any tips on cleaning in the springtime, share them with us in the comment section below.